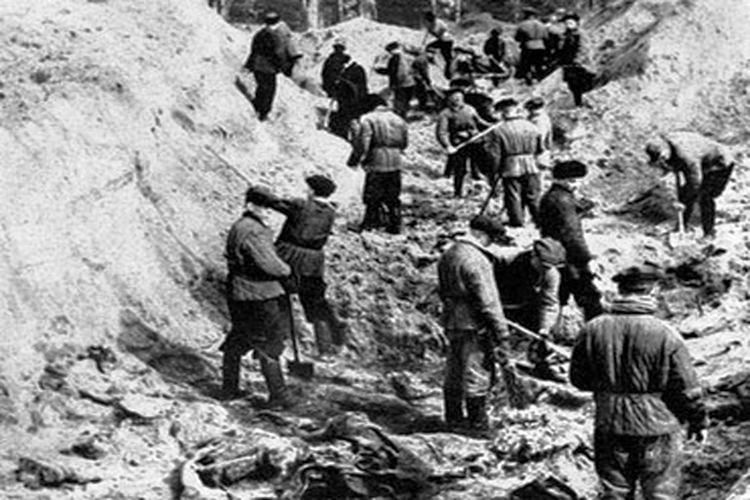 Later investigations concluded the Soviet version of the Katyn massacre was a complete fabrication. The first news of strange and terrible happenings at Katyn was broadcast by Radio Berlin on 13 April 1943. A report has reached us from Smolensk to the effect that the local inhabitants have mentioned to the German authorities the existence of a place where mass executions have been carried out by the Bolsheviks and where 10,000 Polish officers have been murdered by the Soviet Secret State Police. 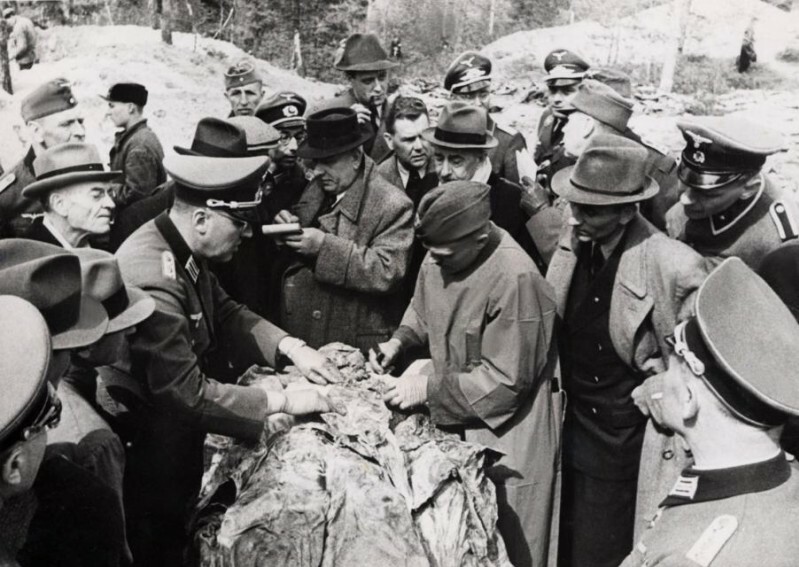 The German authorities accordingly went to a place called the Hill of Goats (Kozogory), a Russian health resort situated 12 kilometres west of Smolensk, where a gruesome discovery was made. A ditch was found, 28 metres long and 16 metres wide, in which the bodies of 3,000 Polish officers were piled up in twelve layers. They were fully dressed in military uniforms, some were bound, and all had pistol shot wounds in the back of their heads. There will be no difficulty in identifying the bodies as, owing to the nature of the ground, they are in a state of mummification and the Russians had left on the bodies their personal documents. It has been stated today that General Smorawinsky from Lublin has been found among other murdered officers. Previously these officers were in a camp at Kozelsk near Orel and in February and March 1940 were brought in “cattle” freight cars to Smolensk. Thence they were taken in lorries to the Hill of Goats and murdered there by the Bolsheviks. The search for further pits is in progress. New layers may be found under those already discovered. It is estimated that the total number of officers killed amounts to 10,000, which would correspond to the entire cadre of Polish officers taken prisoner by the Russians. As it came from Dr Goebbels’ Propaganda Ministry, this communiqué was automatically suspect. On the other hand, the history of Soviet- Polish relationship since 1939 had been such that the story could not be lightly dismissed. 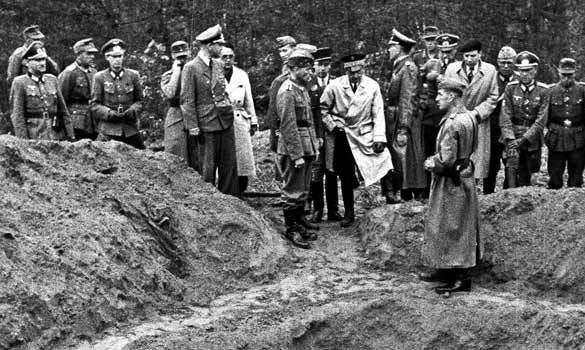 German authorities examine bodies at the site of the Katyn massacre. During the next days the closeness of the collaboration between Germany and Russia became apparent. Poland was formally partitioned on 28 September and, in the hope of ending the bitter fighting, a manifesto was issued by the Russian General Timoschenko exhorting the soldiers of the Polish army to turn upon their officers and surrender. In return for laying down their arms, all Polish prisoners of war were guaranteed complete freedom of movement and it was promised they would be permitted to make their way to Rumania and Hungary en route for France, where they could continue to fight the Germans. This promise was not kept. Polish NCO’s with technical qualifications and all officers were deported from Poland to Russia and accommodated in three main camps: Kozelsk, Starobelsk and Ostashkov. In the late autumn of 1939, letters from them began to reach their families left behind in Poland.